The Tax Cuts and Jobs Act of 2017 was signed into law on December 22, 2017. Understanding the changes will be essential for all taxpayers, especially those abroad. On December 22, 2017, President Donald Trump signed H.R. 1, “An Act to provide for reconciliation pursuant to titles II and V of the concurrent resolution on the budget for fiscal year 2018” into law. The bill is more commonly known as the Tax Cuts and Jobs Act of 2017 (hereinafter “the Act”). The Act was originally introduced in the House of Representatives on November 2, 2017, and contains many adjustments and alterations to the Internal Revenue Code of 1986 for both businesses and individuals. Some of the major changes that will affect individuals include new income tax rates and brackets, an increase in the standard deduction and child tax credit, suspension of the personal exemption and miscellaneous itemized deductions, repeal of the mandatory individual shared responsibility payment and limitations on state and local tax deductions. Many of the provisions included in the Act take effect on January 1, 2018, so taxpayers will largely notice the impact on their 2018 return. The Act is one of the major tax reform bills passed in recent years. Consequently, nearly every return filed for tax years beginning after December 31, 2017, will be affected. Understanding the changes relevant to your tax situation will be a crucial element when crafting a strategy to minimize taxation in the coming years. Individuals and businesses determine their tax liability through the use of the IRS established tax rate schedules, which lists the income brackets and related tax rate. The alteration of these brackets and tax rates is perhaps one of the most significant changes in the Act. Depending on the amount of taxable income, individual income could be subject to the following rates prior to the act: 10%, 15%, 25%, 28%, 33%, 35%, 39.6%. For tax years beginning after December 31, 2017 and before January 1, 2026, individual income may be subject to the following reduced rates: 10%, 12%, 22%, 24%, 32%, 35%, 37%. Prior to the Act, business income subject to corporate tax rates could be taxed at the following rates: 15%, 25%, 34%, 35%, 38%, 39%. For tax years beginning after December 31, 2017, all corporate income is subject to a flat 21% rate. Income and losses generated by corporations with a valid subchapter S election are still passed through to the shareholders and subject to tax at individuals rates. In comparison to the reduction of tax rates for individuals, the changes that affect corporations are by far the most substantial in terms of tax savings. The maximum tax rate dropped from 39% to 21% and there was only one bracket prior to the Act (15%) that taxed corporate income at a lower rate. In addition, many of the tax saving provisions set forth in the Act end on December 31, 2025 for individuals. Conversely, the tax saving provisions for corporations are not slated to revert back. The individual mandate put into place by the Obama administration through the Affordable Care Act was repealed in the Tax Cuts and Jobs Act. Starting in 2019, there will be no more penalty imposed for those without health insurance meeting minimum essential coverage standards. Taxpayers can still face penalties for tax years 2017 and 2018 and should ensure that they have minimum essential coverage or a valid exemption. Penalties can be up to 2.5% of annual income over the federal filing threshold or $695 per adult and $347.50 per child, depending on whichever amount is greater. Those living abroad for a substantial portion of the year can generally claim an exemption from the penalty. 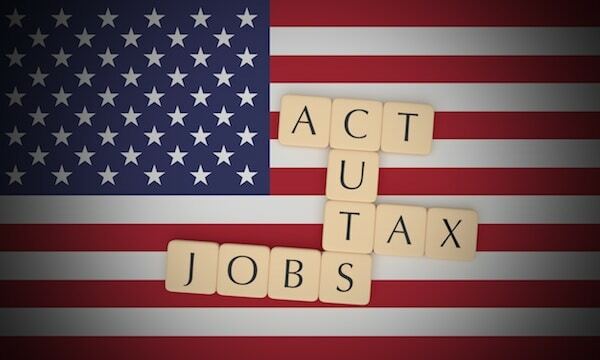 Some of the more major aspects of the Tax Cuts and Jobs Act affecting individual taxpayers are the modification of the standard deduction and changes to certain itemized deductions. The standard deduction is a dollar amount that reduces the amount of income on which you are taxed and varies according to your filing status; there is also an additional standard deduction for individuals who are blind or age 65 or over. Taxpayers can choose to itemize their deductions on Schedule A or utilize the standard deduction. Prior to the Act, the standard deduction for married taxpayers filing jointly was $13,000 ($6,500 for single taxpayers, $9,550 for heads of household). For tax years beginning after December 31, 2017 and before January 1, 2026, the standard deduction has been increased to $24,000 for taxpayers filing jointly ($12,000 for single taxpayers, $18,000 for heads of household). The increase in the standard deduction does not come without decreases and limitations to other deductions. Taxpayers who itemize their deductions will suffer from the loss of miscellaneous deductions and the limitation of the state and local tax deduction. Under the Act, taxpayers may deduct no more than $10,000 ($5,000 for taxpayers married filing separately) in state and local taxes. This includes sales tax, state and local income tax, and real-estate taxes. Miscellaneous itemized deductions that were subject to the 2% floor are suspended for tax years 2018-2025. This includes deductions for unreimbursed business expenses (such as union dues, travel expenses, and business meals), tax preparation expenses, and other expenses (such as investment advisory fees, safe deposit box rental, and casualty/theft losses). Taxpayers abroad should note that the new limitations on state income taxes and property taxes come along with the disallowance of the deduction for property taxes paid related to foreign real estate. Prior to the Act, foreign real estate property taxes were fully deductible on Schedule A if the taxpayer was itemizing their deductions. Some other changes to itemized deductions claimed on Schedule A are the decrease of the medical expense deduction floor and modification of the home equity indebtedness threshold pertaining to the mortgage interest deduction. If itemizing, taxpayers are able to reduce their taxable income by the amount of qualified medical expenses paid during the tax year that exceeds a certain threshold of adjusted gross income. For tax years 2017 and 2018, the threshold is lowered to 7.5% of adjusted gross income for all taxpayers. Prior to the Act, the threshold was 10% for taxpayers under the age of 65. Taxpayers who itemize can also reduce their taxable income by the amount of mortgage interest paid for their principal or second residence. The total value of mortgage and home equity indebtedness was limited to $1 million ($500,000 for married taxpayers filing separately) preceding the passage of the Act. The new provision sets forth a reduced limit of $750,000 ($375,000 for married taxpayers filing separately). This provision applies to indebtedness incurred after December 15, 2017. Taxpayers who refinance mortgages incurred prior to December 15, 2017 will not be subject to the reduced limit unless the refinancing results in additional amounts borrowed. Previously, most common charitable contributions were limited to fifty percent of adjusted gross income. Charitable contributions that are unable to be deducted in the current year can typically be carried forward for the next five years. The new law proposed in the Tax Cuts and Jobs Act increases the limit to sixty percent of adjusted gross income for tax years beginning after December 31, 2017. The carryover of unused contributions remains the same. Some taxpayers may benefit more utilizing the new increased standard deduction rather than itemizing their deductions, which is required in order to deduct charitable contributions. Charitable contributions to foreign charities are still not deductible. The personal exemption allows most people to lower their taxable income and reduce the amount of tax owed for the year. Typically, a taxpayer can claim an exemption for themselves, their spouse (if filing jointly), and dependents claimed on the return. The personal exemption for 2017 is $4,050, so a typical three-person family can reduce their taxable income by $12,150. For tax years beginning January 1, 2018 through December 31, 2025, the personal exemption has been completely suspended. High-income earners will not notice as much of a difference in their return because the personal exemption is completely phased out for married filing jointly taxpayers with an adjusted gross income in excess of $436,300 ($384,000 for single filers). Alimony has long been a reportable item on the payor and the payee’s federal tax return. The payor receives a deduction for the amount of alimony paid and the recipient includes the income on their return. The Tax Cuts and Jobs Act removed the requirement for taxpayers to report alimony paid or received. The new law applies to divorce and separation agreements entered after December 31, 2018. As a result, income used to pay alimony is taxed on the payors return. The moving expense deduction is available to help taxpayers reduce their tax liability if the moved in connection with a new job and meet other qualifications. For tax years 2018-2025, the moving expense deduction has been suspended completely. In addition, prior to the Act, employees were able to exclude qualified moving expense reimbursements from gross income. This exclusion is also suspended for tax years 2018-2025. However, there is an exception for active duty members of the Armed Forces. The Tax Cuts and Jobs Act expanded the definition of the term ‘qualified higher education expense’ as it relates to Section 529 plans. A 529 plan helps taxpayers save for higher education. Distributions from such plans are not subject to federal tax so long as the proceeds are used for qualified education expenses. Qualified education expenses now include expenses for tuition associated with attending an elementary or secondary public, private, or religious school. Another amendment limits the number of such distributions to $10,000 per beneficiary per taxable year. The new law is effective for distributions made after December 31, 2017. While not included in the new legislation, the deduction for tuition and fees was set to expire after tax year 2016 and was not extended by Congress. The deduction from adjusted gross income was favored over other education credits by some due to the less stringent eligibility requirements. However, many taxpayers end up benefiting more from using the American Opportunity Tax Credit or Lifetime Learning Credit if they are eligible. These two credits remain unchanged along with the student loan interest deduction and educator expense deduction. Federal gift and estate taxes remain intact under the Tax Cuts and Jobs Act but with a few adjustments. In 2017, taxpayers are able to give up to $14,000 of gifts without having any gift tax consequences. Additionally, the lifetime exclusion, which represents the total amount of assets that can be transferred as a gift (in excess of annual exclusion) or through an estate, is $5,490,000 in 2017. Staring in 2018, the lifetime exclusion is increased to $10,000,000 before taking into account the required adjustment for inflation. The final amount has not yet been released and will be posted on www.IRS.gov as soon as it becomes available. The annual exclusion pertaining to gifts is increased to $15,000 for tax year 2018. Learn more about gift tax as it relates to Americans and taxpayers abroad by here. Many members of Congress argued that owners of other business entities, such as sole-proprietorships, S corporations, and partnerships should also get to enjoy savings from the Act, rather than just traditional corporations. The new provision, available for tax years 2018-2025, allows for a twenty percent deduction from adjusted gross income depending on the amount of qualified business income earned. One of the more pertinent limitations that came along with the new deduction is the disallowance for taxpayers who operate ‘specified service trades or businesses’. Specified service trades or businesses are largely considered any business in the law, accounting, health, actuarial, consulting, financial or brokerage industries where the principal asset of the business is the reputation or skill of one or more of its employees. This limitation will exclude a vast majority of taxpayers but there is an exclusion available for taxpayers with less than $157,500 of taxable income ($315,000 for joint filers) that will generally allow them to claim the full twenty percent deduction. The deduction is phased out completely for single taxpayers if taxable income is $50,000 or more over the threshold ($100,000 for joint filers). The twenty percent deduction is only taken into consideration when calculating federal income tax and will not reduce the amount of self-employment tax owed. Americans and U.S. taxpayers abroad should be aware that qualified business income does not include foreign earned income. For the purposes of Section 199A, qualified items of income are effectively connected to a trade or business within the United States. The requirement means that most taxpayers living abroad will not get to take this deduction. Corporations not only stand to benefit from a reduced flat rate of federal income tax. The Tax Cuts and Jobs Act eliminates the corporate alternative minimum tax altogether. Alternative minimum tax is a separate tax that is imposed in addition to regular tax under certain conditions. It generally applies to taxpayers who have certain types of income that receive favorable treatment, or who qualify for certain deductions, under the tax law. The additional tax aims to limit the amount these benefits for higher-income individuals. Although the tax remains in effect for individuals, the Act increases the exemption amount from $84,500 (2017) to $109,400 for taxpayers filing jointly ($70,300 for single filers). Individual taxpayers that find themselves owing alternative minimum tax typically do not get to utilize the full exemption amount due to income phase-out limitations. The phase-out limitation threshold was generously raised from $160,900 (2017) to $1,000,000 for taxpayers filing jointly, and to $500,000 for single filers from $120,700 (2017). Moreover, certain circumstances that result in alternative minimum tax have been limited or suspended in the Act. For example, common scenarios that trigger the tax like a high amount of personal exemptions claimed or a large deduction for state and local taxes will not occur under the new legislation. Consequently, the number of individual taxpayers who owe alternative minimum tax will decrease. The changes for individual filers are set to expire on December 31, 2025, similar to many of the other tax saving provisions made available to individuals. The Foreign Tax Credit and Foreign Earned Income Exclusion remain relatively unchanged in the new legislation. Those who utilize the Foreign Earned Income Exclusion may notice that the increase for inflation each year has decreased slightly. This is because the Act made a minor change in the way inflation is calculated for the exclusion. In the past, the exclusion amount ($102,100 in 2017), was indexed for inflation using the Consumer Price Index. Going forward, the exclusion amount will be tied to the Chained Consumer Price Index, which generally rises at a more gradual rate than the previously used Consumer Price Index. Another noteworthy element of the Tax Cuts and Jobs Act is the repatriation of earnings held in certain specified foreign corporations. The new law is effective for the last taxable year of a specified foreign corporation that begins before January 1, 2018. All controlled foreign corporations are considered specified foreign corporations as well as any foreign corporation (except passive foreign investment companies) that have a U.S. shareholder who owns ten percent or more of voting stock. Those U.S. shareholders that find themselves as in this situation will need to include their pro rata share of accumulated post-1986 foreign earnings on their tax return. A 15.5% rate is imposed on undistributed earnings that are being retained as cash or cash equivalents, and an 8% rate is imposed on all other earnings. If electing the pay the liability in installments, the taxpayer must make the first installment payment by the due date of their return, without the consideration for any extensions of time for filing the return. Each subsequent installment is due on the due date of the following year’s tax return. Earnings that were already subject to tax can be distributed in the future tax free. Effective for tax years after December 31, 2017, shareholders of controlled foreign corporations will now have to include their share of income deemed as global intangible low-taxed income on their return. For the purposes of Section 951, the term ‘global intangible low-taxed income’ is the excess of a shareholder’s net tested income from a controlled foreign corporation over the net deemed tangible income for the year. Net tested income is generally considered to be the controlled foreign corporation’s gross income, not including Subpart F income, foreign oil and gas extraction income, and income subject to U.S. tax as effectively connected income. Net deemed tangible income is the excess of 10 percent of the aggregate of such shareholder’s pro rata share of the qualified business asset investment of each controlled foreign corporation, over the amount of interest expense taken into account in determining the shareholder’s net CFC tested income. Certain rules associated with Subpart F as it relates to controlled foreign corporations were also changed in the Tax Cuts and Jobs Act. The definition of a U.S. shareholder under the pre-act law only included individuals that own ten percent or more of the voting stock of a foreign corporation. The new definition for tax years after 2017 now includes U.S. shareholders who own ten percent or more of voting stock or the total value of the foreign corporation’s stock. Further, the new legislation eliminates the thirty-day requirement in regard to controlled foreign corporations. Prior to the Act, U.S. shareholders of foreign corporations would have to include Subpart F income on their return if the foreign corporation was a deemed a controlled foreign corporation for at least thirty consecutive days during a taxable year. Learn more about Subpart F income here. Essentially all taxpayers can expect to notice at least a minor change on their 2018 return. In general, the majority of taxpayers who do not itemize their deductions currently will see a benefit from the increased standard deduction and lowered tax rates. Additionally, taxpayers with large families, especially with children under the age of 17, will suffer from the elimination of the personal exemption but also benefit from the increased child tax credit. Certain business owners, depending on the amount of qualified business income, stand to save from the qualified business income deduction. Taxpayers who itemize their deductions and live in states that impose high income or real estate taxes will generally lose a portion of these deductions. Accordingly, they may have a higher effective tax rate than previous years. The reduced tax rates may be enough to offset the additional tax owed but every situation will be different. U.S. taxpayers abroad generally lose out with the new tax provisions in the Tax Cuts and Jobs Act. Exclusion amounts calculated for the Foreign Earned Income Exclusion are now tied to a more slowly rising Chained Consumer Price Index. Despite efforts to minimize the burden of double-taxation, individuals abroad are still taxed on their worldwide income and subject to the Foreign Account Tax Compliance Act (FATCA) reporting requirements. Furthermore, taxpayers abroad will lose the ability to deduct foreign real estate property taxes on Schedule A and are unable to enjoy any savings from the new qualified business income deduction. Owners of foreign corporations find themselves faced with additional regulations and complications that will certainly pose challenges in the coming future. Ultimately, the tax bill that was promoted as being a simplification of the tax code, largely ended up complicating tax matters for taxpayers living abroad, especially those who own foreign corporations.